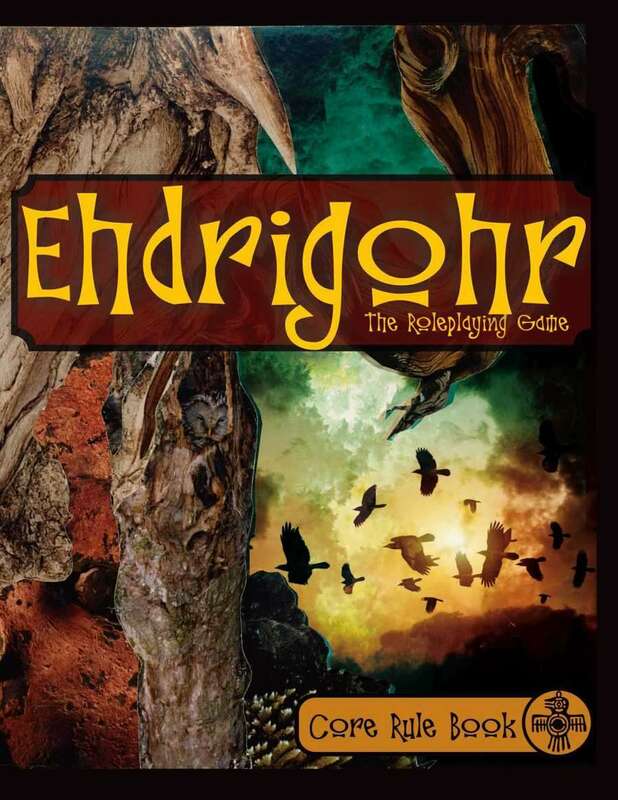 Ehdrigohr is a Fate Core based tabletop role-playing game where you get to play a character struggling to survive in this recovering world. It is a fantasy game of high heroics, myth and culture, powerful magic, and survival horror. The tides of darkness are overwhelming but this is not meant to be a game of nihilism. It is about hope. Your characters are the mythic heroes who do impossible things that push back the tide. There are multitudes of paths to greatness. • A warrior, imbued with mystic martial arts who fights on The Line. • A storyteller who keeps the peoples’ spirits up and empowers their hearts to fight another day. • A wandering peacekeeper that ferrets out the infiltrators and hatemongers who work to break the nations. • A reality weaving Way-walker who travels the wild places seeking the breaches where the creatures trapped in the Twain have broken through the pale into the world. Culturally, Ehdrigohr is a non-traditional fantasy world. 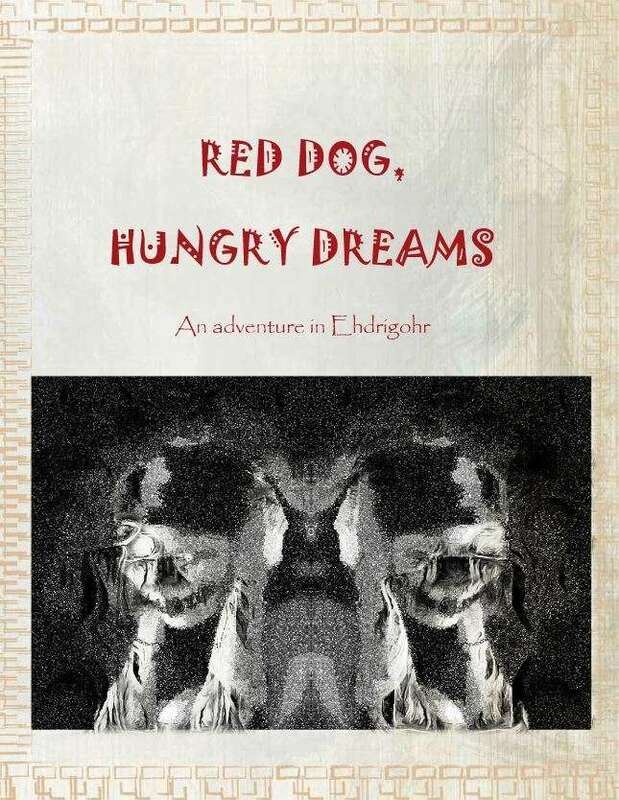 Rather than fantasy seen through a Euro-Medieval lens, Ehdrigohr is instead crafted to take inspiration from the myth and folklore of tribal, and indigenous, cultures from around the world. Though it is a human-centric world, each of the cultures of Ehdrigohr promises to have its own flavor steeped in magic. These are not “primitive” cultures but nations that have chosen their own interesting paths and traditions in their effort to survive the ravenous hordes that come in the night. Though it presents a different flavor of fantasy, there is a point of entry for many styles of play. There is high adventure, political intrigue, delving, social plays, secret societies, monster bashing, monster fleeing, and so on. Mechanically, Ehdrigohr relies on the Fate Core system to deliver most of its fun. The mechanics have been tailored to the ideals of the setting, though you can still expand on it with ideas from other FATE-based games out there in the market. More about the FATE system can be found at www.faterpg.com. In addition to being a fun game and an interesting world to explore Ehdrigohr is also a game of allegories. It examines our relationships with each other and the powerful force that is depression and how it whittles away at us, sending terrible thoughts that come when we are in dark places, bring us shivers, and cause us to fade. We hope to inspire people to hold strong in the darkness and fight your way through to a new light. You can purchase the game as a downloadable PDF, color softcover, or color hardback by clicking the catalog images below. 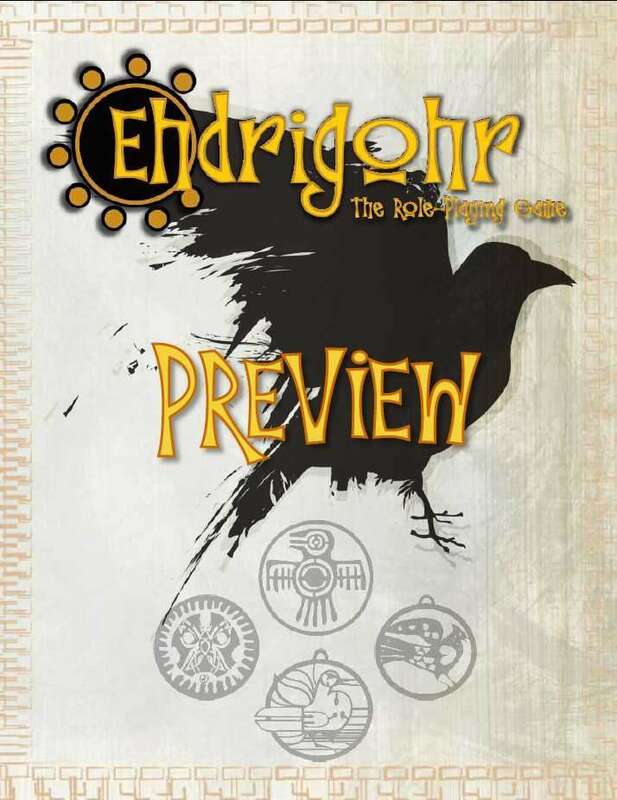 Check out the Ehdrigohr Preview for free to get a taste of the world and what it has to offer. I didn’t realize this wasn’t showing. It has been fixed and should show for you now. There has been a hiccup somewhere and it appears that some images got unlinked somehow. The game looks really interesting. I was unable to jump into the KS. What are your plans to market it after getting it out to the KS participants? Sorry this reply is coming late I just noticed the comment caught in my spam filters. Once the book ships it will be available on rpg.net as a pdf and a Print on Demand. I’ll also be endeavoring to get it into local game stores and listed for purchase on Amazon and Barnes and Noble as an Ebook and physical book. Are there any plans of making a Dungeon World compatible version? Welcome! There are systems I’m eager to port the game to but have a long list of things to do before I get to them. If you want to try your hand at doing a fan port be my guest. I’m only one person and there are a ton of great systems out there (I’ve got a D6 port on simmer for a while now). The best thing I can do to help is pull together an article with suggestions of how to work the setting with some systems while keeping the big ideas of the experience alive. That should at least give people who want to undertake the endeavor seriously something to navigate with. I’ve been looking for a game like this for many years! I have one question before i buy – i am unfamiliar with the FATE core system. If i purchase the Ehdrigohr Core Rulebook, would i also need to purchase a FATE core rulebook to run a game? No, the main book covers enough Fate Core and the variations in play to let you be able to play. Buying the main Fate Core book might be a good long term purchase though as you get a better understanding for the systema nd want to make your own tweaks. You can see their baseline and use it to help you tweak for all sorts of other variations. This seems like a truly novel and intriguing story setting with thoughtful gaming mechanics to match. My RPG days may be behind me, but I’d love to read some fiction set in this world. I’d encourage you to seek out a group of authors to create some short stories. The setting lends itself to a range of genres, from fable to Lovecraftian horror (I could imagine Neil Gaiman sinking his teeth in deeply). A diversity of dramatic stories gathered in a collection would also be an effective promotional tool and player resource. Thanks for the thought. it’s a good idea. I’ve been rolling around similar thoughts of deep fiction explorations of the setting. I’m still figuring out a lot of the best practices for keeping folks focused in the big ideas of the world but I’d definitely love to see what other authors do with it at some point. I’m also exploring ways of engaging it via interactive fiction (ala choose your own adventure style) for people who are intrigued by that mix of game and fiction but don’t want to play a full tabletop rpg but want some way to interact with, and explore, the world. Good to see you resurface! Is there any word on the last two adventures from the Kickstarter? Hi! Yes. Thanks for asking. I’m still finishing the second. I kinda rushed the first one and wasn’t really happy with it (and intend to revisit it when I finish these last two) so I’ve been taking my time with number two (Runs Rabbit, Bleeds Sky) so it gives you a lot of stuff to play with. Of course that’s been severely complicated by my work and teaching schedule. It’s focused in the Beyduun Wastes so I want it to double as a mini source-book too so when you’re done you have more to work with int he area. I’m on summer break now so I’ll be hammering away at it (among other things) and reconnecting with artists for illustrations. If you’d like to see an ugly first draft and start playing with it, message me with an email address and I’ll send it to you. I don’t have a Fate group at the moment, so I’ll wait, but good to know they’re coming! As a gussuk who grew up hearing Yu’pik, Inupiaq, and Athabascan stories off and on… I am SO stoked about this game. Many thanks- and congratulations!- for getting this published. You’re very welcome. I’d love to hear how you adapt your own tribe into the cultures of the book. There are some easy places but I highly encourage exploring seeding your peoples stories into the world as the main lens you play through. It will make the experience more true to you and your players. Gussuk (and Nalaugmiut) are words from Yu’pik and Inupiaq respectively that mean”white guy.” 😉 I think I’ll be keeping my “tribe” well clear of this. Hah! Well, I hope you bought this for any Indigenous homies you have! Hi, I am intrigued by your game and am thinking about getting the pdf. It seems that it shares a notable “headspace” with the setting of Glorantha, particularly as revealed since the HeroQuest system took over as the core system.Are you aware of the setting, and have you considered making contact with the people behind it, #MoonDesign? A meeting of such minds could be greatly beneficiial to both parties. It’s funny I never read any Glorantha back in the day. Another game designer friend of mine, Ron Edwards, said the same thing so I picked up the two Giant Glorantha tomes from MoonDesign last year and was very impressed. At some point I’d love to pick some of their brains as Glorantha seems to have grown more from the need to deliver an experience of that world and it’s peoples than a need to be rules. I like that. 40 years of growth and writing has lead to a wonderfully rich world. I can only hope that I can grow Ehdrigohr to such proportions. This game looks really interesting and like a lot of fun. I have very limited experience with tabletop gaming–just a couple of Pathfinder adventures–so I’m curious how this compares as far as ease of entry. Assuming I had a group of friends who wanted to play, would a newbie be able to run this with any success? Is there a recommended group size in addition to the DM? It’s actually fairly easy to pick up and play (and might even be easier if you have little table top rpg experience). You don’t have to dive deep into rules and options. You can start with a vague idea of how things work and add more play detail as your group needs. I just posted, on the blog, an actual play session that hopefully gives you an idea of how a Fate session (at least this flavor of Fate) might go. Is this going to be available at GenCon, by chance? I won’t have a booth or be vending anywhere at GenCon if that’s what you’re asking. You can always buy it from DriveThruRPG though. I noticed that some of the Kickstarter options included tabletop maps. Is there anyway to buy one now? By encouraging people to become players and designers I hope to get them, as my primary goal, to see the power of a narrative to transform. When we see the story as a story we can see what it hides, what it supports, what supports it, and what expectations it sets and what meanings it gives to things that might otherwise be arbitrary both within and without. Copyright (c) 2015 Council Of Fools LLC, All rights reserved.